Pizza Hut has officially changed its name to Pasta Hut. Despite the timing, this is not an April Fool's joke. To reflect the seriousness of the makeover, they'll be changing the logo on their Dallas, Texas company headquarters to reflect their new food focus, starting today. You can expect to see the new Tuscani Pastas on the menu the next time you step into a Pasta Hut. Currently, there are two just choices: Meaty Marinara and Creamy Chicken Alfredo. Priced at $11.99, the 3-pound trays of pasta are meant to feed four people and will be baked just like the pizzas. 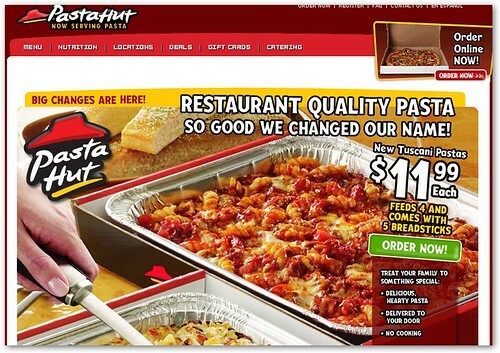 The first inklings of the big change came when Trademork uncovered a trademark claim by Pizza Hut, Inc. for the mark "Pasta Hut" in January 2008. But why the change from pizza to pasta? Partly, it's a result of higher cheese and flour prices, which have made pizzas a lower margin product. The other is that pizza sales have stagnated with 2006 sales falling to $5.2 billion from $5.3 billion the year before. This article is an April Fools Joke. And it is all on you who read it and believe it. Introduces Pasta. Keeps Pizza Hut Name. “This year, marks our 50th anniversary as Pizza Hut. For the past 50 years Pizza Hut has been known as a fun-loving company with a history of firsts including becoming the first global pizza chain, the first chain to offer text and mobile ordering from a cell phone and even the first to send our logo to space. But in all this time we’ve never participated in an April Fools Day joke. This year, we’re the first national chain to deliver restaurant-quality pastas right to customers’ doors with the introduction of our new Tuscani Pastas. We figured what better time than now for some light-hearted fun. While we will not be making a permanent name change to Pasta Hut, we are very serious about making pasta a significant part of our business moving forward, and the notion of the name change was a direct result of feedback from our customers who told us our new Tuscani Pastas were so good we should change our name.